Sign-up Night for Pierce Cub Scouts August 30th! 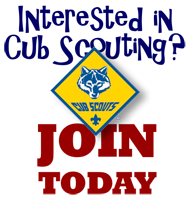 Interested in joining Cub Scouts at Pierce Elementary and Pack 134. Come check us out on August 30th from 6:30 - 7:30 at Pierce Elementary School. Prospective parents will be able to meet with the Pack leadership and current scout parents while the prospective scouts join our current scouts in some games, crafts, and smore making.